Today we begin a NEW catagory of World War II Stories -- In Their Own Words. The pages that follow are dedicated to our neighbors to the north...the Canadians. We recently came into contact with a gentleman by the name of Stanley Scilowski who served with the Canadian forces during World War II. Stan served with the Perth Regiment of Canada, 11th Infantry Brigade of the 5th Canadian Armoured Division. Stan served mainly during the Mediterrian Campaign and received the Canadian Voluntary Service medal; the Defence of Britain medal; the 1939/45 Star for 6 months or over in a war theater; the Italy Star for service in that campaign; the Victory medal. He indicated that the Canadians once looked and scoffed at the "Yanks" for their proliferation of medal handouts. Now he has come to the conclusion that might have been so, but his people (Canada) were too damed stingy with similar citations. Stan has kindly arranged for us to display exerpts from his published works entitled: Not All of Us Were Brave published in October 1997 by Dundurn Press. His book contains 400 pages, and contains some 20 illustrations. The pages that follow in the category of "Canadian Army Heroes" are dedicated to the men and women served with distinction in the forces of the Canadian (Military) Army. They served in many theaters of the war including North Africa, the Italian Peninsula, D-Day and the massive invasion of Normandy. Many served thought the arduous campaigns of France and continuing on into Germany. Though less heralded, there were many who served throughout the war at home and were just as determined and dedicated in their efforts. Many of these helped train the men who went off to fight and others served less glamorous rolls in guarding vital military installations back home. These men and women were common citizen soldiers who were placed into heroic situations and performed their duties -- not for glory or rewards; but, because the job had to be done. They did their part. These citizen soldiers came from every walk of life in this vast country, putting on their uniform and marching off to an uncertain future. When the war finally ended, most returned to family and home...many did not. They all served -- with pride! Not all came home boasting a chest full of medals -- nor all did heroic deeds on the great battlefields of the world. But each one was a heroin his own right all the same; enduring and dedicating himself to the task at hand. Thus, another small piece of the vast picture we called the "great war" was fulfilled. Another soldier had done his duty and could come home to his just rewards holding his head high in pride. This series of pages will be a sounding board, have you, for collecting and dissiminating stories from folks such as Stanley Scislowski and others from our neighbor to the north: Canada. It is our hope that by placing these stories by Stan on our website, that others will follow in offering to share their experiences during World War II. With luck and time this section will contain many stories thus far untold. Thank You, Stan for getting in touch with us at World War II Stories -- In Their Own Words and for your generous effort to share with us -- your collective memories of World War II. 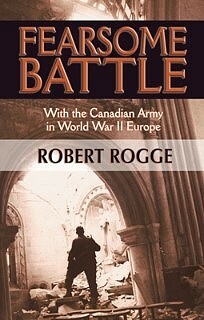 This exerpt is from the book, entitled, Fearsome Battle, written by Robert Rogge, an American serving in the Canadian 3rd Infantry Division during the war. The book is written in the third person and is riviting!